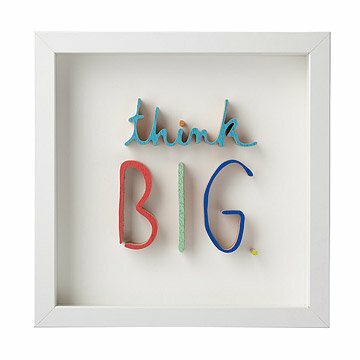 Enjoy an artful reminder to follow your dreams with this hand cut three-dimensional display. Artist Matthew Hoffman presents an artful reminder to follow your dreams with this hand-cut, three-dimensional display. Beautiful solid mahogany wood is hand cut and painted, then presented in a shadowbox frame. Hang in your studio for artistic inspiration, or around your home as a bright and cheerful message. Handmade in Chicago, Illinois. Visit our blog to meet Matthew and hear his thoughts on public art and inspiration. Although Matthew Hoffman's public works have been well published and exhibited internationally, he loves to translate them into everyday items and share them widely: "It's fun to make smaller versions [of my work] that people can have in their lives." He adds that he wants to make something “that gives people a little positivity every day. Wherever the piece ends up, they’re living with it, and it’s something that hopefully creates a daily interaction.” Matthew is the custodian of You Are Beautiful, a project to better the world in little ways. The message of this campaign has reached every corner of the globe, with over 2 million stickers shared. The hope is for us to share uplifting thoughts with each other. Read a Q&A with Matthew. Arrives in shadowbox frame without glass, and can be hung by hook or small sawtooth cleat. Back is signed by artist. I waited on purchasing this piece for some time due to the price, but it is well worth it. I wish the piece was a bit larger, but it's quite beautiful and very well made.